Tracey Leeds in The Girl from Mars Photo by Ron Hall. Harris Nixon’s Jam Night at The Stonegravels, Chesterfield. The Washington Whirligig play at the Unwin Club, Sutton in Ashfield. Towards The Sun play at the Ark Tavern, Brimington. She Said play at 10A High Street, Dronfield. Mart Rodger Manchester Jazz play at Bakewell’s Medway Centre for the Buxton and District Cancer Research charity. The Girl From Mars, jukebox rock musical with Britpop hits, dancers and an 18ft robot, at Real Tiime Live, Chesterfield. Karen Starr entertains The Stonegravels, Chesterfield. The Zedz play at the Ark Tavern, Brimington. Firewire play at the Butchers Arms, Brimington. Selective Hearing play at 10A High Street, Dronfield. Classix Gold play at Brimington Social Club. The Pitz play at The Barley Mow, Bonsall. Kelly Paige entertains Old Whittington Miners Welfare Club, Chesterfield. Amelia Carter Band play at the Ark Tavern, Brimington, at 4.30pm. Rik Gaynor’s karaoke at Brimington Social Club. Paul Stewart entertains Old Whittington Miners Welfare Club, Chesterfield. Jazz jam with Steve Black, Jeremy Meek, Ralph Salt and friends at 10A High Street, Dronfield. 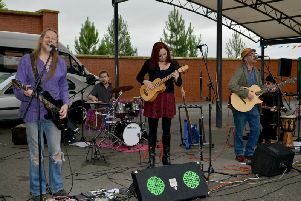 The Jenna Hooson Band play at Clowne Community Centre.